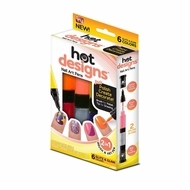 Hot Designs Nail Art Pens- Glitz and Glam Colors Just polish, create and decorate! Get a hot new nail look everyday! If you can make dots and lines, you can make Hot Designs! It's the 2 in 1 brush and art pen! A great way to add beautiful nail art to your manicure and pedicure. Design and Create your own styles with Hot Designs nail art pens. A unique nail pen/brush allows you to apply a base color and then create impressive works of art with the revolutionary pen tip. Each color has its own nail brush to brush on the base color - then just pop the top for a unique nail pen that allows you to get creative with your designs. Try something intricate from our Design Guide, or decorate with one of your own creations! Brush for polish, Tip for drawing. Just squeeze for the perfect amount of polish, draw with the precision tip and create beautiful designs. Available in Basic Beauty Colors OR Glitz and Glam Colors: Glitz and Glam includes: Sparkling Silver and Paradise Pink, Crushed Berry and Hot Orange and Purple Pizzazz and Lemon Yellow THIS LISTING IS FOR GLITZ AND GLAM COLORS. Please see other listing for Basic Beauty and Combo Packs. Features: Ingenious pen tip for simple creations Fine tip points for a precise finish Nail polish bottle is squeezable so you can control the flow of nail polish so that it's just enough every time Includes: 3 x Hot Design Pens- each with 2 colors per pen.